In Part 1 of our series, The Roof , we discussed how the roof is the first line of defense of any home. An extension of that are the gutters. In this series, we will discuss ways to ensure your gutters are working properly. Properly functioning gutters are an extremely important part of any home remaining dry and structurally sound. Yet I’m amazed how often we see gutters/gutter systems that not only aren’t working properly, they’re actually funneling water toward the house! In fact, it’s not uncommon for us to see foliage of some type or other growing out of a rain gutter. The problem is that many people don’t actually see the gutters malfunctioning because they’re not out there when it’s raining and nothing visibly bad is going on inside the house as a result. However, bad gutters could be leading to all kinds of unseen problems including rot and mold growth within your walls and roof edges, as well as foundation deterioration. Having a great roof is important (see series #1) but directing water away from the house is also exceptionally important. There are a number of things that homeowners should look for and can do to keep their gutters flowing properly. By far the number one cause of gutter problems is clogging. While trees of all sorts are the primary source of debris that clogs gutters, the “grit” or “shingle sludge” from aging or cheap roof shingles also can pile up in gutters, especially if they are not properly sloped. Whatever the type of debris, it needs to be cleaned from your gutters on a regular basis. 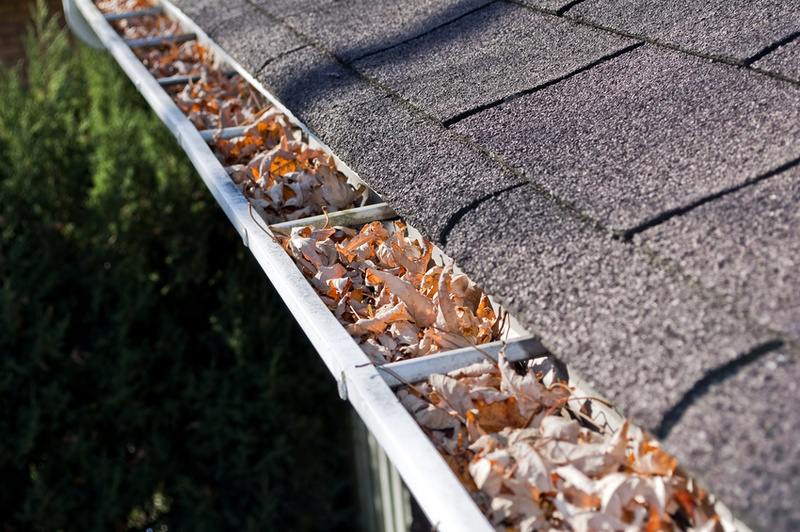 A great time to clean your gutters is late fall after most or all of the leaves have fallen. This ensures that your gutters should be clean and free-flowing for the next year. If you have a lot of trees around your home you may need to do this twice in the fall, once around mid-fall and again after all of the leaves have fallen. Also, if you have trees that create a lot of debris during their budding/spring growth stage, you might also want to consider cleaning the gutters in late spring/early summer. Finally, clean the gutters thoroughly. Even the small debris/shingle sludge can create a clog because it can pile up near the gutter outlet and create a dam. Many folks use a hose with a high-pressure nozzle to spray the fine debris out of the gutter. Some gutters are easier to clean than others so if you are going to clean them yourself please be very safety conscious. REMEMBER, you only have to fall one time to suffer serious injury or worse. Make sure the ladder you’re using is sturdy and that it is set up properly. Move the base regularly. It takes more time, but stretching “just a little bit farther” is often what leads to falls. If you’re working from the roof please use a proper safety harness and lanyard. If you’re at all uncertain that you can clean your gutters safely by yourself, then by all means hire a contractor or handyman to do it for you. If you don’t hire someone to keep your gutters clean you will certainly be hiring someone in the future (at a much greater cost) to address the problems created by your clogged gutters. If you don’t like the idea of cleaning your gutters yourself or paying someone to do it, another option is to add a gutter protection product. This can be a very confusing decision because at last count there are well over 100 different types of products on the market! Based on my experience the vast majority of these products are ultimately ineffective. Over the years, many folks have tried installing a screen or mesh that they purchased at a home center or hardware store. These types of screens do well at keeping out large debris, but little to nothing when it comes to finer debris. Also, because they’re often made very cheaply, they tend to crack, break, twist, and look very unsightly. Beyond that, they are typically installed under the shingles which is something we don’t recommend. (more on that soon). Another product that’s been used a lot has been a gutter cover based on the adhesion principle. This is a solid cover over the top of the gutter. The water flows down the roof and “adheres” to the product so that it flows around the edge and into the gutter. Unfortunately, these products do not keep fine debris from entering the gutter. In fact, they often help to wash it into the gutter. They also are typically mounted under the shingles and they are very unsightly. Finally, in a very heavy rain and especially with steep roof lines, the adhesion principle simply doesn’t work and water washes out over the top of the gutter. The product that we’ve found to work the best is a product that mounts flat (or almost flat) across the top of the gutter. It has a stainless steel, aluminum, and/or galvanized frame that is covered with a micro mesh. We like these types of products for several reasons. First, they work! They do not allow any debris (even shingle grit) into the gutter. The best ones handle a huge volume of water. (There are some flat mounted products that are simply a piece of aluminum with holes drilled through them to allow water through. These do not work well in areas with a large amount of debris and sometimes do not handle large volumes of water.) Secondly, they are mounted to the gutter in the front and to the eave at the rear of the gutter. They do not mount under the shingles! This is very important because your shingles should be installed with a starter course that “seals” the first row of shingles to the roof. When this is broken your shingles are much more likely to be blown up by the wind and you are opening a door for water and ice to more easily back up underneath them. Any issues created by a gutter guard will void any warranty claims from the roofing manufacturer. We like to leave the roof alone! Another advantage to fastening the gutter protection to the eave is that it adds a tremendous amount of strength to the gutter system. Finally, we like the flat mounted, micro mesh gutter covers because they are barely visible (if at all) from the ground. If you decide to go with a gutter protection system I highly recommend that you hire a professional to install a quality product with a solid warranty. Most do-it-yourself gutter protection systems don’t end up working very well and may only be giving you a false sense that your gutters are working properly. Occasionally we’ll find gutters that work well in most situations but tend to overflow during a high-volume rain (even though they’ve been completely cleaned so there is no partial clog). The 2 main culprits in this instance are slope and/or lack of capacity. If a gutter isn’t sloped properly, the water simply doesn’t move fast enough to the downspout in a high-volume rain. Lack of capacity simply means that size of your gutters and/or downspouts are not large enough to handle the volume of water that your roof sometimes sends them. For most homeowners, it is much easier to identify a problem with slope than a lack of capacity so we’ll start with that. For most gutters, you should be able to stand back and easily see that a gutter is sloping. If you can’t, then you might have a problem with slope. If you’re able to get to your gutters with a ladder and a hose, you can try spraying water on the roof and watching the water flow when it lands in the gutter. It should quickly and easily flow toward the outlet point. If you suspect that your gutters aren’t sloped properly, you should have a professional inspect them to be certain. If you do need to add slope to your gutters I would recommend that it be done by a professional because there are a lot of variables involved in the process and it absolutely must be done properly. If your gutters are clean and seem to be sloped properly, yet overflow persists, your problem may be related to capacity. Sometimes this is easily fixed by adding another outlet or increasing the size of the existing outlet and downspout. Sometimes, however, you need to add a larger gutter. For anything related to gutter capacity, I would recommend having a professional take a look. Often a gutter problem is nothing more than properly re-fastening the existing gutters. Snow and ice, house shifting, high winds and more all can tend to pull your gutters away from the eave. This is especially true for half-round gutters and gutters fastened with the “old-fashioned” spikes. If you’re comfortable on a ladder sometimes the fix can be a simple as hammering in the protruding spike. However, it’s a good idea to move it slightly so that it doesn’t go back into the old hole where it was but grabs fresh “meat” on the eave. 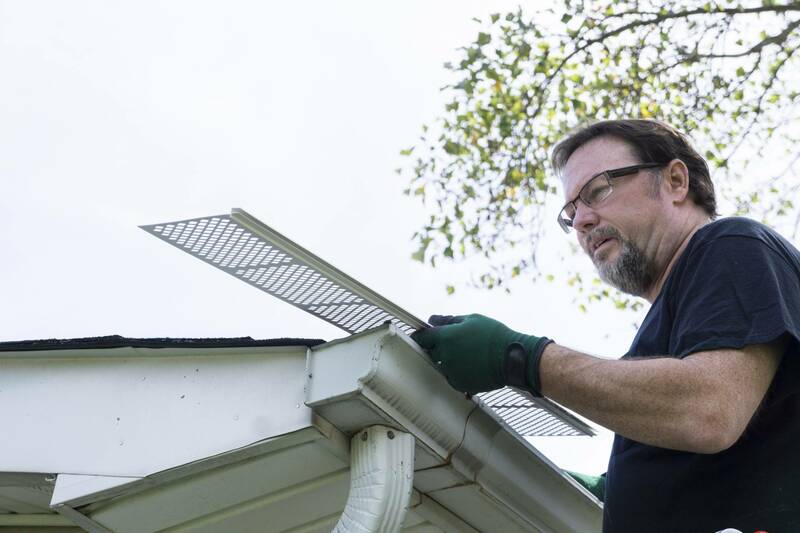 For modern K-style gutters, the best way to re-fasten them is using a “hidden hanger.” No longer do we fasten new gutters with the long spikes you so often have seen sticking out of the gutter. These hidden hangers simply clip into the gutter and then are screwed into the eave. They are exceptionally stronger than the old spikes and can fairly easily be added. You should be able to find them at most hardware stores or home centers. If your home has half-round gutters that are pulling away from the house I would recommend that you have a professional undertake that repair. There are a variety of ways that these types of gutters are fastened and all are somewhat complicated. An often overlooked potential problem area with gutter systems are the downspouts. Your gutters may be flowing great but if the downspouts aren’t properly moving the water down and away from the house they can be an even bigger problem than bad gutters. Why? Because now all of the water from the roof is escaping the system in a concentrated area – the area where the downspout comes out of the gutter. So after you’ve cleaned your gutters, checked them for proper slope and made sure they are fastened properly, it’s important to inspect all of your downspouts. Make sure that all of the connections (the gutter outlet, between the spouts, and all of the various elbows and intersections) are properly fastened to each other and the house itself. If possible, shoot some water through the downspout from the top and watch and see if you’re losing water anywhere. Finally, after you’re certain that your downspouts are working properly, make sure that the water is being carried away from your house and foundation. In part 2 of this series, “Basement/Foundation,” I addressed everything you should look for and can do to make that happen so please refer to that article for those instructions.